CHICAGO, IL--(Marketwired - Mar 18, 2014) - Brandimage, a leading global consultancy of brand equity architects and designers of brand meaning who create brands that drive brand performance, announced today that it will unveil an installation of design artifacts created to demonstrate how Meaningful Branding acts as a powerful trigger for driving brand penetration, building brand equity and creating consumer desire at the FUSE 2014 Conference, April 7-9, 2014, in Chicago. The world's most respected conference in the brand strategy and design community, the 18th annual FUSE conference explores design as a strategic lever and invaluable asset in building better brands and more meaningful relationships with consumers. With One Collective Voice, FUSE becomes a forum for all to share stories, inspiration and best practices. 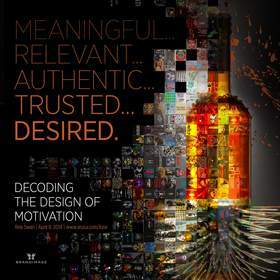 Curated and designed by Brandimage, "The Meaning Of Motivation - An Exploration Of How Design Establishes Trust At The Point Of Transaction and Entices People To Buy And Try," will emphasize how design can create powerful meaning that makes people see ordinary branded propositions in new ways. Leveraging its global creative network, the installation will demonstrate Brandimage's Meaningful Branding approach and how cultural and individual perspectives come together in ideas that drive emotions -- transforming brands from commodities to must haves. The emphasis for each artifact created for display in the installation will be on how consumer emotion and perception can be influenced by design to create brand desirability. Rob Swan, senior vice president, executive creative director and spokesman for the global Brandimage network, commented, "To uncover the deep emotional triggers that motivate consumer behavior, Brandimage considers how codes and behaviors in the culture and marketplace -- and in the sub-conscious of consumers themselves -- create meaning. Meaningful brands that are truly relevant, authentic, trusted and desired resonate deeply with consumers -- they motivate people to become part of their story." Swan added, "FUSE organizers have been great -- very receptive to our installation concept. 'The Meaning of Motivation' allows us to reframe the way attendees come into contact with our brand and share Brandimage's thinking, talent, unique message and point of difference to this must attend industry event." Swan concluded, "The way that brands invite consumers to feel, trust, and buy -- the story they tell at the point of transaction -- is a fundamental cornerstone of the consumer experience, and design is a primary way that they do it. At its best, design combines form, function and aesthetics in the service of telling an intuitive, immediate and meaningful story. Great design ideas tap into human consciousness beyond rational thought... It literally makes us feel a certain way. We'll scratch the surface on exactly why this happens, and how doing this can positively and meaningfully disrupt even the most commoditized product propositions, and in the process define ownable and indelible stories for brands." Swan's presentation, "DECODING THE DESIGN OF MOTIVATION," will be delivered at FUSE 2014 on Tuesday, April 8, 2014, at 2:45 pm Central time. Join the conversation via the hashtags #FUSE14 and #NextBig Design. Brandimage is a global consultancy of brand equity architects and designers. Brandimage creates brands that drive brand performance. Brandimage is part of the brand development group of SGK. For more information visit: http://www.brand-image.com. Follow Brandimage on Facebook: https://www.facebook.com/BrandimageDesign, LinkedIn: http://www.linkedin.com/company/brandimage, and @Brandimage Twitter: https://twitter.com/brandimage Join the conversation via the hashtag #DesignOfMotivation.